Question. 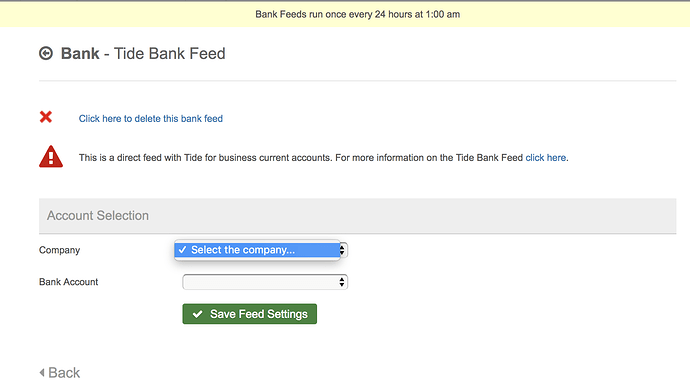 In total I have three Tide bank accounts under the same company. I have added all three of these accounts to QuickFile and activated the auto feed but with the 2nd and 3rd account it doesn’t actually let me select the bank account from the drop down. Will the feed actually work for the 2nd and 3rd account? The list of accounts is provided to us by Tide, so if you’re seeing them in the Tide app, you should see it in your QuickFile account. I’ll leave this thread public for other users to comment, should they have issues too. I will however send you a private message so we can take a look at this for you.